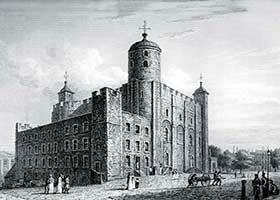 The History of the Tower of London is great, bloody and cruel and the Salt Tower has its part to play in its story. Salt Tower is just one of the 21 towers which, together, form the Tower of London castle complex. The Tower of London covers an area of 18 acres and its magnificent architecture covers almost all the styles which have flourished in England. Although the Tower is no longer a place of great military strength it has in time past been a fortress, a palace, and a prison. This section provides key facts and information about the Salt Tower. The purpose of the Salt Tower changed according to the requirements of the era. Who built the Salt Tower in the great Tower of London? The Salt Tower was initially called the Julius Caesar’s Tower and then Baliol's Tower. It is possible that the building was given the lasting nickname of the 'Salt Tower' as in medieval England salt was extremely expensive and only afforded by the higher Nobility. These Lords sat on the dais at the 'high table' and their commoner servants at lower trestle tables. The salt was placed in the centre of the high table and only those of the appropriate rank had access to it. Those less favoured on the lower tables were "beneath the salt". It is possible that this expensive commodity was traditionally stored in this building. The very walls of the Salt Tower contain some of the bloody secrets and the of the history of the Tower of London. Which King was responsible for building the Salt Tower and what was his reason? When was it built? Interesting facts and info about the history of the Tower of London!